There are many reasons why the Ford Mustang has become the world’s best-selling sports coupe. For starters, the new Ford Mustang is always the most capable, most impressive and most fun-to-drive sports coupe each and every model year. And then, once it sets that new benchmark, it comes back the next model year better than ever before and sets an entirely new benchmark. To see how true that statement really is, all you need to do is look at this 2018 Ford Mustang versus 2017 Ford Mustang head-to-head model comparison. In it, you’ll see that the new Mustang completely outperforms the 2017 Mustang. And thanks to a comprehensive suite of all-new safety, technology, comfort and convenience features, the 2018 Mustang is the most advanced and most capable Mustang that’s ever been built. What are the Advantages of the New Ford Mustang at Akins Ford near Atlanta GA? “Less is more” has never been a more accurate statement than when used to describe the engine lineup for the 2018 Ford Mustang. While the 2017 Ford Mustang offered the choice between three powerful and efficient engines, the 2018 Mustang offers only two. Now, that may seem like a step back, but, in fact, nothing could be further from the truth. That’s because the 2018 Ford Mustang has done away with the 2017 Mustang’s base 3.7-liter V6 engine in favor of a 2.3-liter EcoBoost four-cylinder engine. This engine is available for the 2017 Mustang, and offered 310 horsepower and 320 pound-feet of torque while getting 21 miles per gallon in the city and 30 miles per gallon on the highway with that model. Thanks to a bump from the transient overboost function, Ford has achieved even more power and better fuel efficiency when teaming this engine up with the 2018 Mustang. The new Mustang’s 5.0-liter V8 Coyote engine is also more powerful and more efficient than the 2017 Mustang’s 5.0-liter V8 GT engine, which offered 435 horsepower and 400 pound-feet of torque while getting 15 miles per gallon in the city and 25 miles per gallon on the highway. 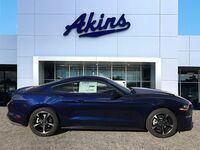 For more on the 2018 Ford Mustang, please contact our friendly Akins Ford staff near Atlanta, GA.